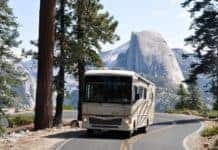 With Thanksgiving right around the corner, many people will be travelling across the United States to spend time with their loved ones for the holidays. Attending Thanksgiving Day parades can be a great way to spend time with your family this holiday. To spice up your tradition, you should try to attend, or tune in at the very least, to the top 8 Thanksgiving Day Parades throughout the US. 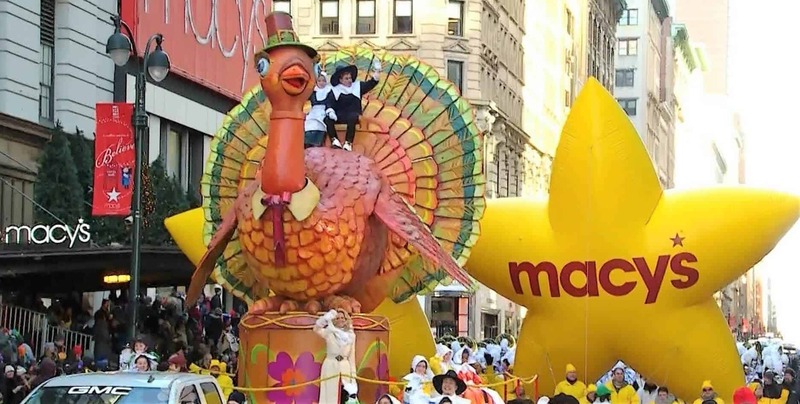 The first Thanksgiving Day parade on this list is the most well known of all parades – Macy’s Thanksgiving Day Parade. This parade, presented by the department store Macy’s, takes place in New York and takes the crown as the world’s largest parade. It debuted in 1924, making it the second oldest Thanksgiving Day parade in the US. This iconic parade has a three-hour duration that starts in Manhattan at 9 am EST and has been televised on NBC since 1952. What makes this parade memorable for people of all ages, is the giant character balloons that are presented throughout the parade; the characters balloons are, usually, the most well-known cartoon characters in the US. To name a few examples: Donald Duck, Popeye, Kermit the Frog, Superman, Garfield, Betty Boop, and many more make appearances in the Macy’s Day parade. In addition to the amazing character and novelty balloons that are showcased during the parade, it is also well-known for having live music and performances from up-and-coming singers and bands. Both college and high school marching bands perform during the parade, making it a more inclusive of performers from all walks of life. The Dunkin’ Donuts parade is considered to be the oldest Thanksgiving parade in the US. With the first parade taking place in 1920 Philadelphia, this parade is a good 4 years older than the Macy’s Day parade. Its page from the Visit Philly website details that this 1.4 mile parade is a “true Philadelphia tradition” for ushering Philadelphia into the holiday season. The parade hosts a plethora of giant balloons, massive floats, and local performers from choirs, dance groups, marching bands, and more; Santa Claus even makes an appearance in this event. 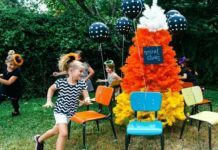 With almost 100 years under its belt, this parade has hosted a wide variety of balloons bearing the face of beloved cartoon characters like Bugs Bunny, The Penguins of Madagascar, and Strawberry Shortcake, to name a few. 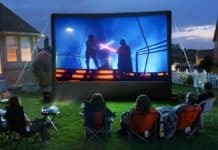 For those who will be in Philadelphia for the holidays, make sure to be early and snag your spot on the steps of the Philadelphia Museum of Art, which is the top spot for watching the festivities. If there are no standing space, you can also head to the nearby Comcast Building and watch this amazing parade in the massive Comcast Experience Video Wall. 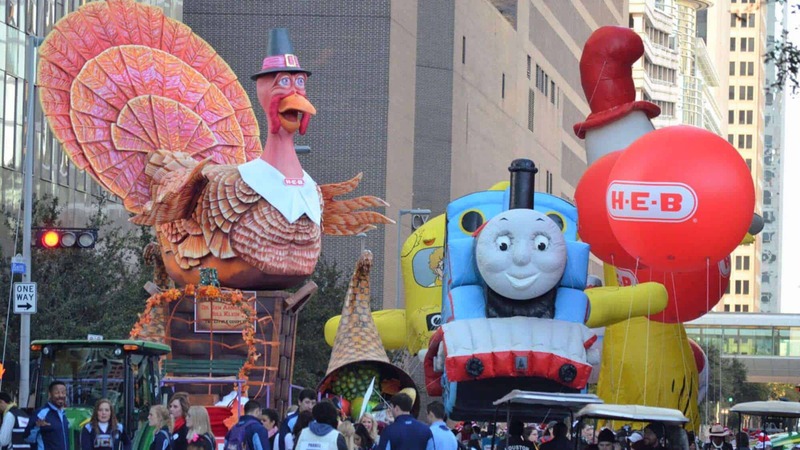 The next Thanksgiving spectacle on our list takes place in downtown Houston, appropriately named “Houston Thanksgiving Day Parade”, and is hosted by the supermarket chain “H-E-B”. The Houston website, explains that the Houston Thanksgiving Day Parade first began in 1949 and continues to bring communities together to showcase and celebrate Houston’s arts and cultural communities. Like most Thanksgiving Day parades, Houston’s takes place on Thanksgiving morning. Similar to most parades, the H-E-B spectacle has giant balloons of children’s favorite cartoon characters, such as Caillou, Garfield, and Butterscotch the Elf, to name a few. Balloons of iconic Houston imagery, such as the Lone Star Boot and Astronaut, also make an appearance. With that being said, there are also floats and performers that are unique to Houston’s parade. A giant float of a H-E-B Grocery Cart, and the Houston Astros baseball team are great examples of unique features of this parade. The next parade takes place in the heart of Chicago and is considered to be “Chicago’s Grand Holiday Tradition”. The Uncle Dan’s Thanksgiving Parade is produced and presented by the Chicago Festival Association and is held in Downtown Chicago. A Thanksgiving Day parade with a rich history, this spectacle has been renamed 10 times in its 84-year life. The name “State Street Christmas Parade” had the longest tenure of any other names, reigning from 1935 until 1983. 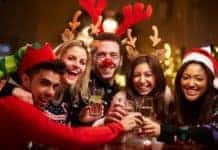 Interestingly enough, Chicago’s Grand Holiday Tradition was sponsored by fast food powerhouse McDonald’s twice in its life, in 1984 and in 2006. 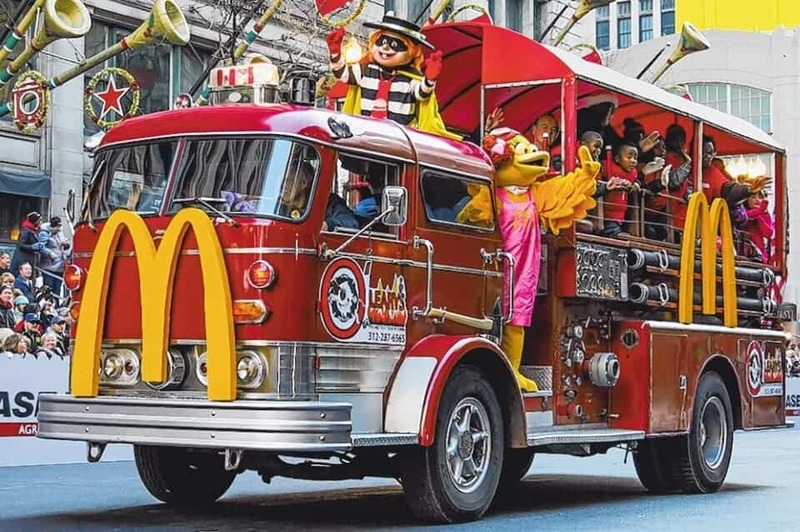 In fact, McDonald’s sponsored the parade until 2018, and named the ceremony “McDonald’s Thanksgiving Parade”. Chicago’s Thanksgiving Parade regularly brings in 3+ million viewers each year and has had over 350,000 spectators in attendance of the parade. Chicago’s ceremony has over 100 different groups, categorized under 5 major units: giant inflatables, specialty units, equestrian units, marching bands, and floats. Unique to Chicago, the producers of the parade hold a “training” school to prepare all participants for the parade, in hopes to keep the parade running smoothly and on schedule. Each year, the parade has “featured” balloons, which are the main attractions of that year’s parade. Teddy Turkey, the mascot of Chicago’s Grand Holiday Tradition, is a featured balloon often throughout the parade’s history. 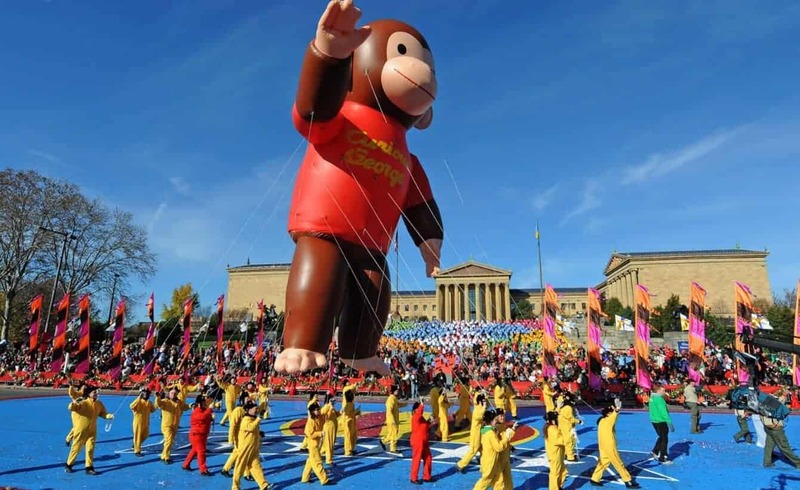 Usually, besides Teddy Turkey, the featured balloons are beloved cartoon characters, like Scooby Doo, Kung Fu Panda, Pac-Man, and Curious George to name a few examples. The next parade on our list was voted the second-Best Holiday Parade overall and Best Thanksgiving Parade, in 2017. America’s Thanksgiving Parade is hosted in Detroit’s historic Woodward Avenue and has been a tradition since 1924, sharing the title of second-oldest Thanksgiving parade in the United States with the Macy’s Thanksgiving Day Parade. It is also 4 years younger than the Dunkin’ Donuts Thanksgiving Day Parade hosted in Philadelphia, Pennsylvania. The parade features a plethora of gigantic floats, impressive balloons, and astonishing live performances. The main feature of the ceremony, however, is the arrival of Santa Claus who serves to bring in the arrival of Christmas Season. 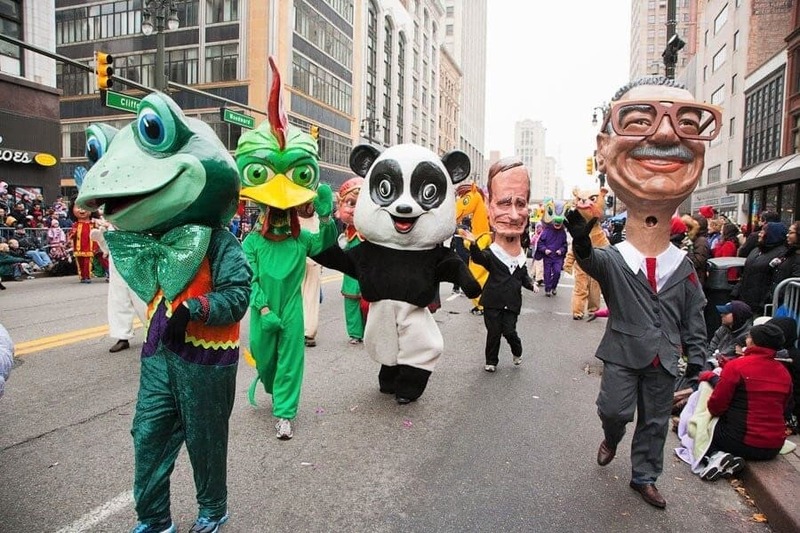 Truly unique to Detroit’s Thanksgiving Day parade are the large collection of papier-mâché heads, named “Big Head Corps”, and the “Distinguished Clown Corps” which features local corporate and community leaders dressed as clowns. Previously known as the Carolinas’ Carrousel Parade, and the Carolinas Thanksgiving Day Parade in 2008 and 2009, takes a spot in our Thanksgiving Day parade list. This Thanksgiving procession is held in Charlotte, North Carolina and was founded in 1947. This parade was originally sponsored by Belk, a department store, but vacated the sponsorship title in 2013, to Novant Health. 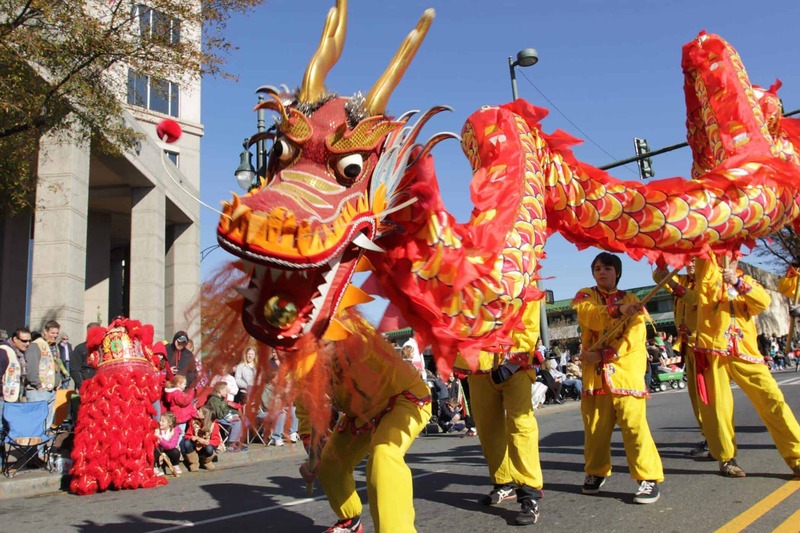 Charlotte’s Thanksgiving parade is unique in the fact that it has held a scholarship program for students who are recognized with outstanding academic achievements and community involvement. From the years 1998 to 2012, they also awarded scholarships to outstanding marching band students. Another unique aspect of this Thanksgiving parade was its reluctance to perform the ceremony in the mornings, unlike most other Thanksgiving parades. However, the parade discontinued this tradition in 2008. The parade was named the fourth-largest parade in the United States, with an estimated 100,000 spectators on average. The second to last spot on our list goes to Massachusetts’ America’s Hometown Parade. 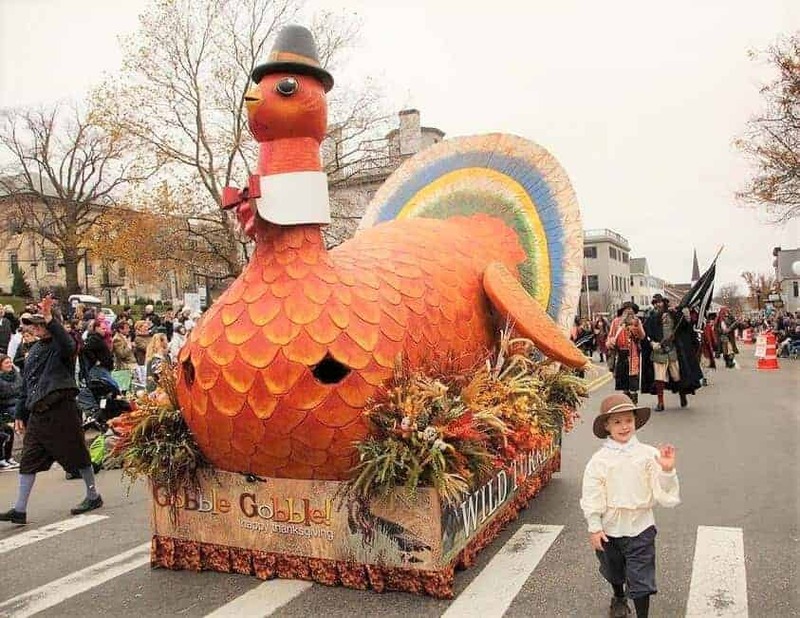 This parade is nationally ranked as the #1 Thanksgiving parade in the nation by AOL and is the only historically accurate chronological parade in the United States. With an arsenal of beautifully decorated floats, this ceremony walks its spectators through America’s heritage during the 17th through 21st centuries, also known as the Pilgrim era. The parade is supported through a wide range of entertainment that fits the float’s era, such as the drum and fife, pipe, drum and bugle corps, and military bands, that also honor the courageous men and women who have served in the military. The parade is only the beginning of a truly amazing festival, with musical acts, historic reenactments, and vintage American cars. Another great detail is that the opening ceremony and parade is interspersed for the deaf and hard of hearing spectators. 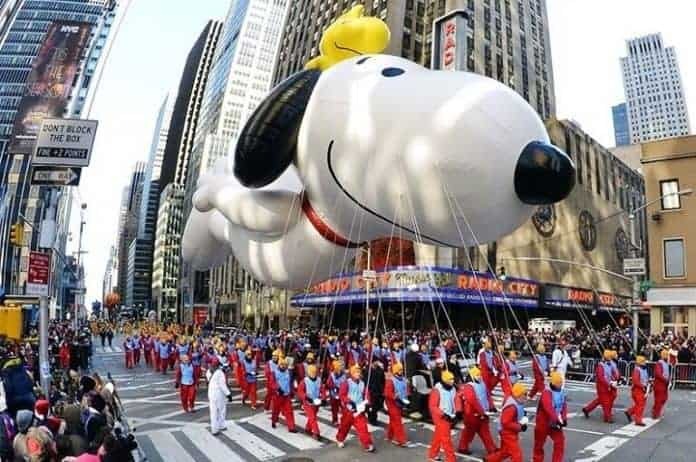 Unlike most Thanksgiving parades, America’s Hometown Parade is held the week before Thanksgiving, to accommodate the large crowd that visits the festival from all over the United States. The final parade on our list is the Hollywood Christmas Parade that is held in Los Angeles, California to celebrate both Thanksgiving and welcome the holiday season. 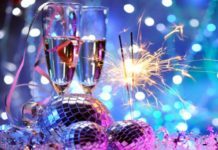 The parade route is marked by red carpet, much like you would see at most movie premiers, and has a large quantity of performers, hosts, celebrities, and balloons. Each year has a new grand marshal, usually a celebrity, that presents and hosts the parade. The first ever parade in Los Angeles was in 1928 and followed a short 1.4-mile route. Earlier parades consisted of an appearance by Santa Claus in his sled, and one or two celebrities. A stark difference from today, where the parade follows a 5-mile route and has headlining performances, famous celebrities, and huge character balloons that Thanksgiving parades are known for. This parade does have a pageant every year and hosts a large swatch of marching band performances to get its spectators into the holiday spirit. 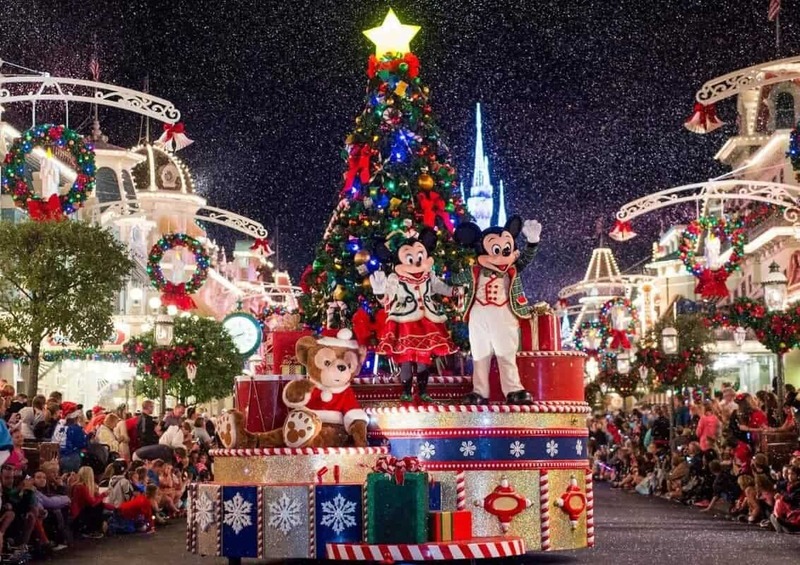 Along with the Macy’s Thanksgiving Parade and Chicago’s McDonald’s Thanksgiving Parade, The Hollywood Christmas parade is also televised throughout the nation. Unlike other parades, the Hollywood Christmas Parade is held on the Sunday after Thanksgiving in the late afternoon. 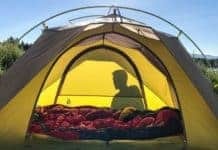 In conclusion, there are many great ways to make your Thanksgiving holiday more memorable. We promise that neither you, nor your family, will regret attending these spectacular Thanksgiving shows and parades. Happy holidays!